When I look back on my life, there were definite moments where the youngster artist began to appear. One particular event was in kindergarten in Decatur Alabama when my teacher (Ms Pitts) singled me out in the middle of class to praise a drawing (coloring book style) of the earth that the whole class had attempted. It is still memorable to me, so I know it was an important "shaping" moment that taught me that art, for me, could be both meaningful and beneficial. Drawing and painting became a regular habit, and mostly for those rewards. I didn't miss out on too much "kids stuff", as this painting might depict, but I definitely focused on art more than the others around me. 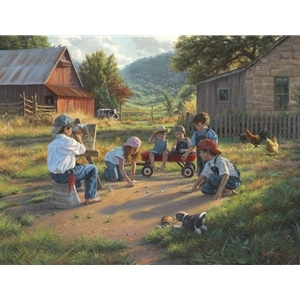 In this whimsical "look back" in time, the current "me" is the farmer in the barn looking at these adorable kids (and himself back in time) as they play a serious game of marbles for keeps, while the young artist is more "caught up in his surroundings" - which was another theme in my life. In either case, as an adult we can learn a lot from the little ones on the Art of Being Young.